It's over a year since I first took part in Project 333 (a wardrobe simplifying project) and it has taught me so much. Here's why I'll be joining in with the next round of the project, starting on April 1st, wearing 33 items for the next 3 months. ♥ It will make me clear out, clean and organise my wardrobe and the results will give me pleasure. ♥ Less choice means less time making decisions over what to wear. ♥ I will discover new clothing combinations. ♥ It will push me to release those clothes I've been hanging onto for too long and donate last year's stored maybe clothes to charity (I haven't missed many since they've been stored in the loft). ♥ I will choose 33 items but I may make up a few rules of my own (this is OK). ♥ My favourite clothes will get worn more and I will feel more confident. ♥ I will pack away my winter clothes and boots and celebrate the joy of lighter clothes. ♥ It will help me to value quality over quantity. ♥ I will know the gaps in my wardrobe and will waste less money on unnecessary wardrobe purchases in the future. ♥ It will challenge me to develop a more colour coordinated wardrobe. ♥ It will remind me that clothing is a necessity and that fashion can be frivolous. ♥ My clothes are not what I am. I'm very tempted to take part in this as well... it would mean a *Major* overhaul in my wardrobe... lol! But how freeing it must feel! I think this would be really good for me. I need to invest more time thinking about it and going through my clothes. What a great idea. I am trying to declutter at the moment and am working my way through my wardrobe. If its not being worn then out it goes. Great quotation from Caitlin Moran - I do often feel like this about my clothes. I've followed some of your advice on streamlining my wardrobe though I found Project 33 a little extreme for me, At least now I put more thought into what I buy rather than indulging in impulse purchases. 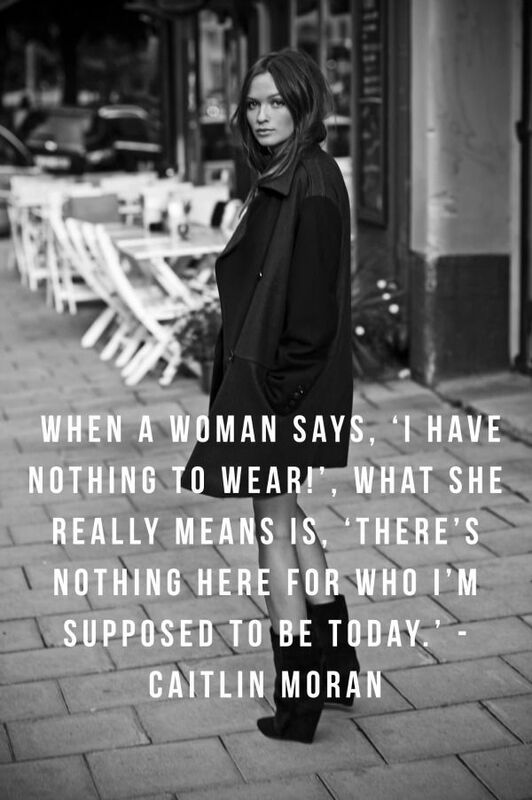 Project 333 really seems to help a lot of women find focus in their wardrobes (and sometimes lives!). I haven't participated in 333, but over the years I've drastically pared down my wardrobe and I am so much happier having done so. Now I just lament all that precious time and money spent accumulating things I didn't need! Ugh. It's a great idea. I need to declutter as well I think. I do so love getting rid of things, it makes me feel lighter and more positive. i was at a charity fashion show this past weekend and the main speaker opened with that quote! so true. i love all your reasons for participating in 333. it helped me beyond measure. i no longer have to actually participate b/c my entire wardrobe is made up of less than 50 garments, prob closer to 40. i so agree with you in that now all my clothes are worn and i always feel confident. that is such a great feeling. adding you to my blog list now! Thanks Claire for the inspiration to do Project 333 starting this April. The reverse hanger thing worked well but I still have more clothes than I need and want to have more space in my new smaller closets. This is a brilliant idea. I may do this after I complete my No Retail Shopping Until Black Friday challenge.